Thai noodles are some of the most popular in the world, and when you taste them, you'll know why. Find classic Pad Thai recipes, quick and easy noodle dishes, as well as numerous recipes for delicious rice noodles (gluten-free). And if you're vegetarian, you'll also find vegetarian noodle recipes - it's all here, and it's all noodle delicious! This scrumptious noodle recipe is the real deal—a version of famous Pad Thai (only easier) direct from Thailand. It features stir-fried rice noodles with chicken in a tangy sauce along with toppings of chopped nuts and basil. You'll love the sweet-sour balance of flavors along with the comforting combination of chicken and noodles. An easy, everyday dish that is sure to bring a smile to your face. Try these yummy classic Pad Thai noodles. They're simple to make and so delicious, you may even find them addictive. Pair with a cold lager or crisp glass of white wine, and enjoy! This Chicken Pad Thai recipe will "wow" your taste buds with its abundance of flavors and textures! Authentic and simple to make, this easy recipe for Pad Thai is a definite keeper. Chicken Pad Thai is one of the most famous Thai dishes in the world, and when you taste this recipe, you'll agree it deserves every bit of its reputation. An authentic Pad Thai recipe for real vegetarian Thai food lovers or those who want a lighter noodle dish without the meat. This Pad Thai recipe does offer adequate protein in the form of eggs (vegans can omit this ingredient), and ground nuts. 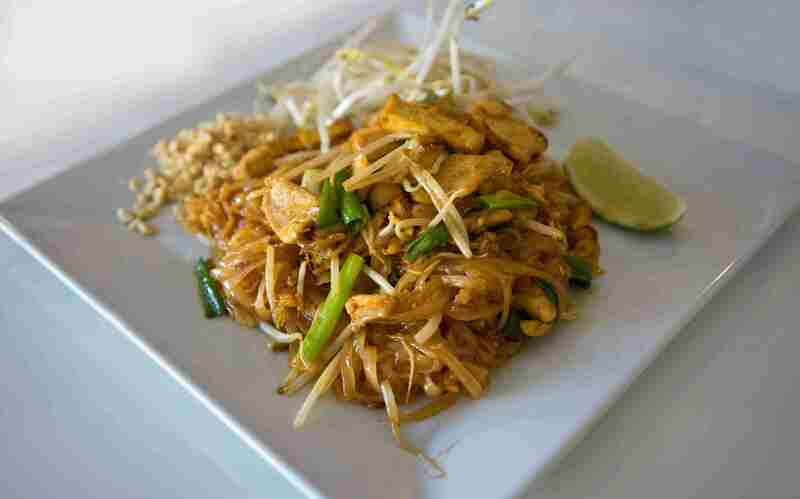 Plus, because it's made with rice noodles, Pad Thai is a gluten-free recipe. Although vegetables are not strictly part of traditional Pad Thai, I've added a little bok choy to make this dish even more nutritious. Pad See Ew is a Thai noodle dish that is made with broad, flat rice noodles, also known as "river noodles." Pad See Ew can be made with chicken, pork, or beef, but otherwise has the same basic ingredients. This noodle dish is truly Asian comfort food at its best; at the same time, Thai river noodles make a healthy and energy-giving lunch or dinner. This Thai fusion noodle recipe is extremely easy, plus healthy and wonderfully delicious! Rice noodles and fresh basil are the key ingredients, which means this yummy noodle recipe is vegetarian/vegan, plus gluten-free. It starts with a Thai-style pesto which is then briefly fried up with Thai rice noodles. Add a topping of ground cashews plus a little fresh basil, and you have a noodle dish that will satisfy your strongest noodle cravings. Beautiful to serve, this easy noodle recipe also makes a great dish to serve company. If you're a fan of Asian noodles, be sure to try these Chinese-inspired Thai beef stir-fried noodles. This dish is super-delicious and also very healthy making it a perfect one-dish meal any night of the week. The recipe is also quite flexible. Make it as spicy or mild as you like, and add your own choice of vegetables depending on what you have on hand. Authentic Thai peanut noodles are made with real peanuts instead of peanut butter and you'll taste the difference! This dish offers a flavorful, nutty sauce combined with the chewy-sticky texture of stir-fried rice noodles. Add your choice of chicken or tofu, or make them vegetarian or vegan—it's all good. This easy stir-fried noodle dish starts with thin rice noodles (also called "rice stick" at Asian stores). Added to this delicious dish are shiitake mushrooms, peppers, bean sprouts, and your choice of chicken or tofu. Add a special Thai sauce and you have a terrific noodle dish. As a bonus, these noodles are healthy, low-fat, and gluten-free. They're so good, you'll find it hard to stop eating them. Glass noodles, also known as 'cellophane' or 'bean thread' noodles, are a culinary wonder. Made of mung bean or green pea flour, glass noodles are transparent when cooked and are completely wheat/gluten free (Note: this recipe can also be made with thin rice noodles, available at nearly every supermarket these days). These Thai coconut noodles are aromatic and flavorful, plus they're quick and easy to prepare. Make them with shrimp or strips of chicken, or substitute with other seafood such as scallops, squid, or slices of filleted fish. Rice noodles are normally used for this recipe, but wheat or egg noodles are also delicious. These stir-fried noodles are made with a flavorful stir-fry sauce composed of lime juice, soy sauce, white pepper, and chili. This dish can be made vegetarian/vegan if you prefer, or get creative and add your own choice of protein source (chicken, tofu, and shrimp are all delicious options). Easy to make and scrumptious to eat, these noodles will fast become a noodle standard in your home. If you like Asian noodle salads, try this delicious Pad Thai Noodle Salad Recipe! Based on world-famous Pad Thai noodles, this salad features bold Thai flavors and an abundance of textures. It's also light in calories and fat, plus naturally gluten-free! 'A bowl of comfort' is the best way to describe this delicious soup. One of the most popular soups on this site, this noodle soup is a meal unto itself, providing plenty of veggies as well as protein. Superb on a cool day! Sesame noodles are one of many dishes brought to Thailand by Chinese immigrants more than a century ago. These noodles are simple to make and very similar to the Chinese except I find there is more depth of flavor owing to the addition of fish sauce and shrimp paste. The use of pure sesame oil adds beneficial fatty acids to your diet, so don't be tempted to leave it out; it also adds loads of flavor to an already abundantly flavorful noodle dish. This easy recipe for pasta salad is super-delicious and virtually fat-free. Asian-style egg or wheat noodles or fettuccini pasta noodles are tossed in an array of fresh vegetables, shrimp, and herbs for the best pasta salad you'll have all summer. This curry noodles recipe is a condensed version of an ancient Thai noodle dish called "Kao Soy". Since it would take an hour or more to make the original recipe, I've simplified it somewhat while still maintaining that delicious original taste. You can use dried egg or wheat noodles for this dish or splurge and pick up some fresh noodles at your local Asian food store or grocery store deli. A delicious curry noodle recipe you'll be sure to enjoy.